Great Ormond Street Hospital believe Charlie has no chance of survival and said it was a "distressing situation". 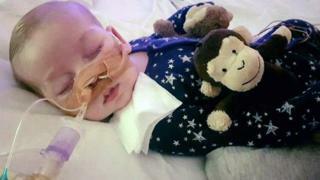 On Tuesday, Charlie's parents lost their final legal appeal to take him to the US for treatment. Judges at the European Court of Human Rights concluded that further treatment would "continue to cause Charlie significant harm", in line with advice from specialists at Great Ormond Street. Ten-month-old Charlie is thought to be one of 16 children in the world to have mitochondrial depletion syndrome, a condition which causes progressive muscle weakness and brain damage. Doctors have said he cannot see, hear, move, cry or swallow. He has been receiving specialist treatment at Great Ormond Street Hospital since October last year. 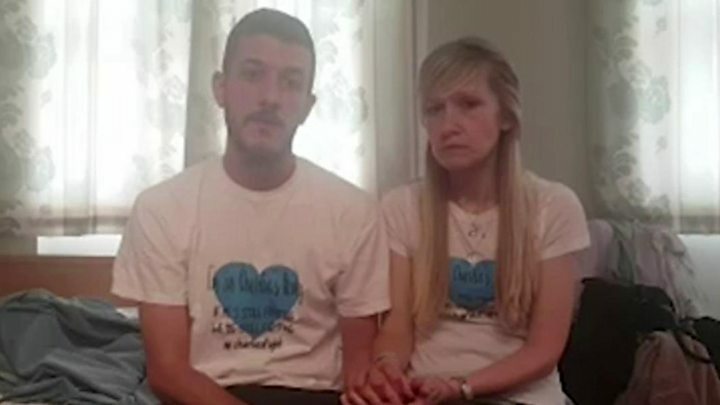 In a video statement Ms Yates, from Bedfont, west London, said: "We've promised our little boy every single day that we would take him home, because that is a promise we thought we could keep. "We were told he has to die in that hospital." Charlie's parents say they have "begged" administrators to "give us this weekend" to allow his family to say goodbye. "Some of our family can't come until tomorrow so the last time they saw Charlie is the last time they will ever see him", Mr Gard said. Charlie's parents raised £1.3m on a crowdfunding site to pay for the experimental treatment in the US. Ms Yates had already indicated the money would go towards a charity for mitochondrial depletion syndromes if Charlie did "not get his chance".